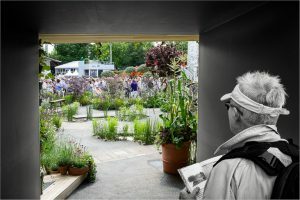 I have been going to the Chelsea Flower Show for a few years and it is always an enjoyable day out. It represents the ultimate in gardening, even if everything on display is a construct. Ephemeral, the show gardens exist for a brief period with one ultimate aim. To be in peak condition when the judges come calling. That said, I do wonder how many of the more fanciful show gardens are typical of what people commission from the designers concerned. Even the more conventional ones represent an ideal; a gardening utopia only made possible through dint of expense and several months of hard work. Occasionally, some of the gardens will be rebuilt elsewhere. Most, though, are dismanted into their constituent parts at the end of the show. My photograph is an attempt to sum up the event in a single shot. This is the only the second occasion when I have used the colour popping technique. In this instance, it is doubly symbolic. 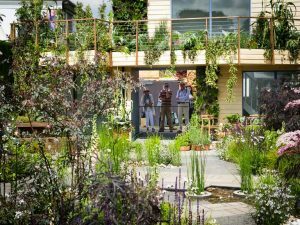 The image depicts the RHS Greening Grey Britain Garden. Its aim is to encourage greater use of plants in urban areas, turning grey to green. On another level, I see it as a metaphor for the drabness of reality yielding to the perfection of a show garden. As well as the garden, it is possible to see the crowds on the opposite side looking in on it. Only the privileged few ever get the opportunity to walk in a show garden. Assistants are talking to people and handing out details of the planting. Further back, the BBC studios are visible; Chelsea week always figures prominently in the TV schedules. 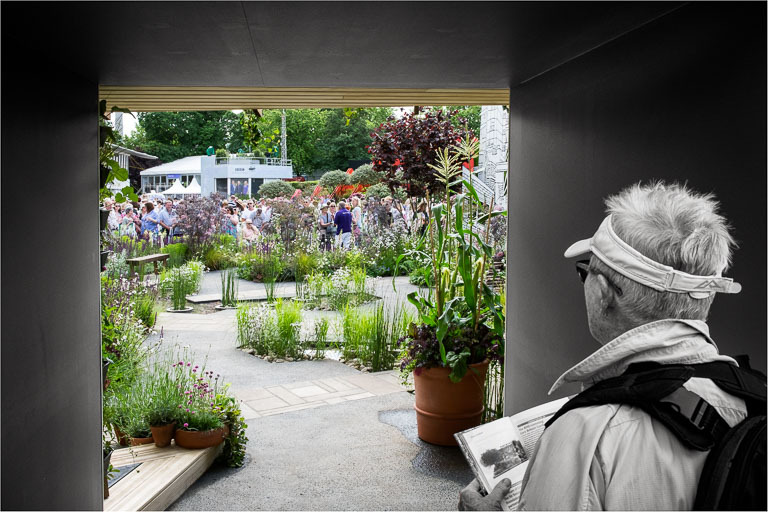 The visitor in the foreground who obligingly, if unwittingly, stood by the opening onto the garden is holding the show guide open at the relevant page. It was too good an opportunity to miss. The Greening Grey Garden seen from the opposite direction. The opening through which I took the main shot is visible in the background.